There is a wide variety of health systems around the world, with as many histories and organizational structures as there are nations. Implicitly, nations must design and develop health systems in accordance with their needs and resources, although common elements in virtually all health systems are primary healthcare and public health measures. In some countries, health system planning is distributed among market participants. In others, there is a concerted effort among governments, trade unions, charities, religious organizations, or other co-ordinated bodies to deliver planned health care services targeted to the populations they serve. However, health care planning has been described as often evolutionary rather than revolutionary. The World Health Organization (WHO), the directing and coordinating authority for health within the United Nations system, is promoting a goal of universal health care: to ensure that all people obtain the health services they need without suffering financial hardship when paying for them. According to WHO, healthcare systems' goals are good health for the citizens, responsiveness to the expectations of the population, and fair means of funding operations. Progress towards them depends on how systems carry out four vital functions: provision of health care services, resource generation, financing, and stewardship. Other dimensions for the evaluation of health systems include quality, efficiency, acceptability, and equity. They have also been described in the United States as "the five C's": Cost, Coverage, Consistency, Complexity, and Chronic Illness. Also, continuity of health care is a major goal. Healthcare providers are institutions or individuals providing healthcare services. Individuals including health professionals and allied health professions can be self-employed or working as an employee in a hospital, clinic, or other health care institution, whether government operated, private for-profit, or private not-for-profit (e.g. non-governmental organization). They may also work outside of direct patient care such as in a government health department or other agency, medical laboratory, or health training institution. Examples of health workers are doctors, nurses, midwives, dietitians, paramedics, dentists, medical laboratory technologists, therapists, psychologists, pharmacists, chiropractors, optometrists, community health workers, traditional medicine practitioners, and others. Most countries' systems feature a mix of all five models. One study based on data from the OECD concluded that all types of health care finance "are compatible with" an efficient health system. The study also found no relationship between financing and cost control. Many forms of social insurance schemes control their costs by using the bargaining power of their community they represent to control costs in the health care delivery system. For example, by negotiating drug prices directly with pharmaceutical companies negotiating standard fees with the medical profession, or reducing unnecessary health care costs. Social schemes sometimes feature contributions related to earnings as part of a scheme to deliver universal health care, which may or may not also involve the use of commercial and non-commercial insurers. Essentially the more wealthy pay proportionately more into the scheme to cover the needs of the relatively poor who therefore contribute proportionately less. There are usually caps on the contributions of the wealthy and minimum payments that must be made by the insured (often in the form of a minimum contribution, similar to a deductible in commercial insurance models). In most countries, wage costs for healthcare practitioners are estimated to represent between 65% and 80% of renewable health system expenditures. There are three ways to pay medical practitioners: fee for service, capitation, and salary. There has been growing interest in blending elements of these systems. In capitation payment systems, GPs are paid for each patient on their "list", usually with adjustments for factors such as age and gender. According to OECD, "these systems are used in Italy (with some fees), in all four countries of the United Kingdom (with some fees and allowances for specific services), Austria (with fees for specific services), Denmark (one third of income with remainder fee for service), Ireland (since 1989), the Netherlands (fee-for-service for privately insured patients and public employees) and Sweden (from 1994). Capitation payments have become more frequent in "managed care" environments in the United States." Sound information plays an increasingly critical role in the delivery of modern health care and efficiency of health systems. Health informatics – the intersection of information science, medicine and healthcare – deals with the resources, devices, and methods required to optimize the acquisition and use of information in health and biomedicine. Necessary tools for proper health information coding and management include clinical guidelines, formal medical terminologies, and computers and other information and communication technologies. The kinds of health data processed may include patients' medical records, hospital administration and clinical functions, and human resources information. The management of any health system is typically directed through a set of policies and plans adopted by government, private sector business and other groups in areas such as personal healthcare delivery and financing, pharmaceuticals, health human resources, and public health. The rapid emergence of many chronic diseases, which require costly long-term care and treatment, is making many health managers and policy makers re-examine their healthcare delivery practices. An important health issue facing the world currently is HIV/AIDS. Another major public health concern is diabetes. In 2006, according to the World Health Organization, at least 171 million people worldwide suffered from diabetes. Its incidence is increasing rapidly, and it is estimated that by the year 2030, this number will double. A controversial aspect of public health is the control of tobacco smoking, linked to cancer and other chronic illnesses. Since 2000, more and more initiatives have been taken at the international and national levels in order to strengthen national health systems as the core components of the global health system. Having this scope in mind, it is essential to have a clear, and unrestricted, vision of national health systems that might generate further progresses in global health. The elaboration and the selection of performance indicators are indeed both highly dependent on the conceptual framework adopted for the evaluation of the health systems performances. Like most social systems, health systems are complex adaptive systems where change does not necessarily follow rigid management models. In complex systems path dependency, emergent properties and other non-linear patterns are seen, which can lead to the development of inappropriate guidelines for developing responsive health systems. An increasing number of tools and guidelines are being published by international agencies and development partners to assist health system decision-makers to monitor and assess health systems strengthening including human resources development using standard definitions, indicators and measures. In response to a series of papers published in 2012 by members of the World Health Organization's Task Force on Developing Health Systems Guidance, researchers from the Future Health Systems consortium argue that there is insufficient focus on the 'policy implementation gap'. Recognizing the diversity of stakeholders and complexity of health systems is crucial to ensure that evidence-based guidelines are tested with requisite humility and without a rigid adherence to models dominated by a limited number of disciplines. Healthcare services often implement Quality Improvement Initiatives to overcome this policy implementation gap. Although many deliver improved healthcare a large proportion fail to sustain. Numerous tools and frameworks have been created to respond to this challenge and increase improvement longevity. One tool highlighted the need for these tools to respond to user preferences and settings to optimize impact. Direct comparisons of health statistics across nations are complex. 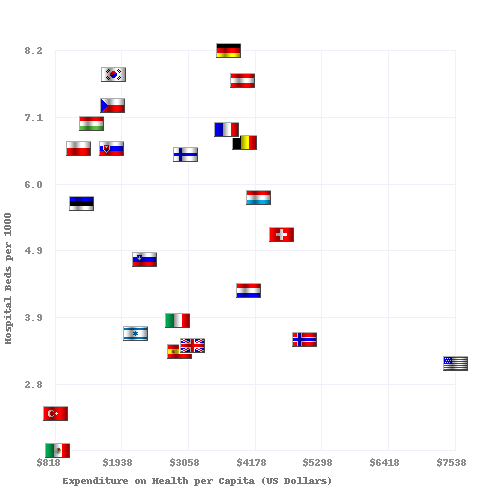 The Commonwealth Fund, in its annual survey, "Mirror, Mirror on the Wall", compares the performance of the health systems in Australia, New Zealand, the United Kingdom, Germany, Canada and the United States Its 2007 study found that, although the United States system is the most expensive, it consistently underperforms compared to the other countries. A major difference between the United States and the other countries in the study is that the United States is the only country without universal health care. The OECD also collects comparative statistics, and has published brief country profiles. Health Consumer Powerhouse makes comparisons between both national health care systems in the Euro health consumer index and specific areas of health care such as diabetes  or hepatitis. 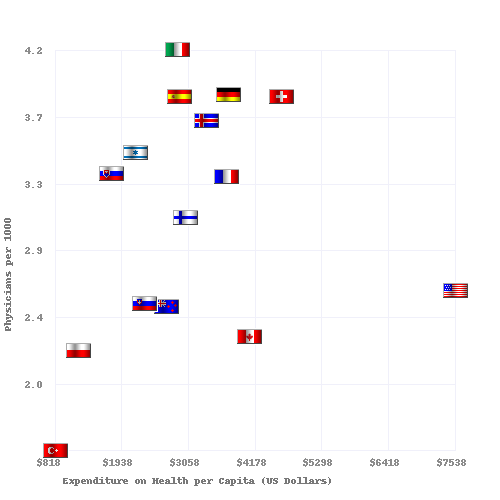 Physicians and hospital beds per 1000 inhabitants vs Health Care Spending in 2008 for OECD Countries. The data source is http://www.oecd.org. ^ White F (2015). "Primary health care and public health: foundations of universal health systems". Med Princ Pract. 24: 103–116. doi:10.1159/000370197. ^ a b "Health care system". Liverpool-ha.org.uk. Retrieved 6 August 2011. ^ Cook, R. I.; Render, M.; Woods, D. (2000). "Gaps in the continuity of care and progress on patient safety". BMJ. 320 (7237): 791–794. doi:10.1136/bmj.320.7237.791. PMC 1117777. PMID 10720370. ^ a b Frenk J (2010). "The global health system: strengthening national health systems as the next step for global progress". PLoS Med. 7: e1000089. doi:10.1371/journal.pmed.1000089. PMC 2797599. PMID 20069038. ^ "Everybody's business. Strengthening health systems to improve health outcomes : WHO's framework for action" (PDF). WHO. 2007. ^ "Regional Overview of Social Health Insurance in South-East Asia Archived 24 February 2007 at the Wayback Machine, World Health Organization. And . Retrieved 18 August 2006. ^ Glied, Sherry A. "Health Care Financing, Efficiency, and Equity." National Bureau of Economic Research, March 2008. Accessed 20 March 2008. ^ Bloom, G; et al. (2008). "Markets, Information Asymmetry And Health Care: Towards New Social Contracts". Social Science and Medicine. 66 (10): 2076–2087. doi:10.1016/j.socscimed.2008.01.034. PMID 18316147. Retrieved 26 May 2012. ^ UNITAID. Republic of Guinea Introduces Air Solidarity Levy to Fight AIDS, TB and Malaria. Archived 12 November 2011 at the Wayback Machine Geneva, 30 June 2011. Accessed 5 July 2011. ^ Saltman RB, Von Otter C. Implementing Planned Markets in Health Care: Balancing Social and Economic Responsibility. Buckingham: Open University Press 1995. ^ Kolehamainen-Aiken RL (1997). "Decentralization and human resources: implications and impact". Human Resources for Health Development. 2 (1): 1–14. ^ a b c d e f g h i j Elizabeth Docteur; Howard Oxley (2003). "Health-Care Systems: Lessons from the Reform Experience" (PDF). OECD. ^ Lucas, H (2008). "Information And Communications Technology For Future Health Systems In Developing Countries". Social Science and Medicine. 66 (10): 2122–2132. doi:10.1016/j.socscimed.2008.01.033. PMID 18343005. Retrieved 26 May 2012. ^ "European Union Public Health Information System – HIV/Aides page". Euphix.org. Retrieved 6 August 2011. ^ "European Union Public Health Information System – Diabetes page". Euphix.org. Retrieved 6 August 2011. ^ "European Union Public Health Information System – Smoking Behaviors page". Euphix.org. Retrieved 6 August 2011. ^ "OECD.StatExtracts, Health, Non-Medical Determinants of Health, Body weight, Overweight or obese population, self-reported and measured, Total population" (Online Statistics). stats.oecd.org. OECD's iLibrary. 2013. Retrieved 24 April 2014. ^ Handler A, Issel M, Turnock B. A conceptual framework to measure performance of the public health system. American Journal of Public Health, 2001, 91(8): 1235–39. ^ Wilson, Tim; Plsek, Paul E. (29 September 2001). "Complexity, leadership, and management in healthcare organisations". BMJ. 323 (7315): 746–749. doi:10.1136/bmj.323.7315.746. ISSN 0959-8138. PMID 11576986. ^ Paina, Ligia; David Peters (5 August 2011). "Understanding pathways for scaling up health services through the lens of complex adaptive systems". Health Policy and Planning. 26 (5): 365–373. doi:10.1093/heapol/czr054. Retrieved 18 May 2012. ^ a b Peters, David; Sara Bennet (2012). "Better Guidance Is Welcome, but without Blinders". PLoS Med. 9 (3): e1001188. doi:10.1371/journal.pmed.1001188. PMC 3308928. PMID 22448148. Retrieved 18 May 2012. ^ "OECD.StatExtracts, Health, Non-Medical Determinants of Health, Body weight, Obese population, self-reported and measured, Total population" (Online Statistics). stats.oecd.org. OECD's iLibrary. 2013. Retrieved 24 April 2014. 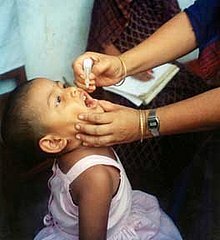 ^ World Health Organization. Monitoring the building blocks of health systems: a handbook of indicators and their measurement strategies. Geneva, WHO Press, 2010. ^ Hyder, A; et al. (2007). "Exploring health systems research and its influence on policy processes in low income countries". BMC Public Health. 7: 309. doi:10.1186/1471-2458-7-309. PMC 2213669. PMID 17974000. Retrieved 26 May 2012. ^ Lennox, Laura; Doyle, Cathal; Reed, Julie E.; Bell, Derek (1 September 2017). "What makes a sustainability tool valuable, practical and useful in real-world healthcare practice? A mixed-methods study on the development of the Long Term Success Tool in Northwest London". BMJ Open. 7 (9): e014417. doi:10.1136/bmjopen-2016-014417. ISSN 2044-6055. ^ Sheikh, Kabir; Lucy Gilson; Irene Akua Agyepong; Kara Hanson; Freddie Ssengooba; Sara Bennett (2011). "Building the Field of Health Policy and Systems Research: Framing the Questions". PLoS Medicine. 8 (8): e1001073. doi:10.1371/journal.pmed.1001073. PMC 3156683. PMID 21857809. Retrieved 22 May 2012. ^ Gilson, Lucy; Kara Hanson; Kabir Sheikh; Irene Akua Agyepong; Freddie Ssengooba; Sara Bennet (2011). "Building the Field of Health Policy and Systems Research: Social Science Matters". PLoS Medicine. 8 (8): e1001079. doi:10.1371/journal.pmed.1001079. PMC 3160340. PMID 21886488. ^ Bennet, Sara; Irene Akua Agyepong; Kabir Sheikh; Kara Hanson; Freddie Ssengooba; Lucy Gilson (2011). "Building the Field of Health Policy and Systems Research: An Agenda for Action". PLoS Medicine. 8 (8): e1001081. doi:10.1371/journal.pmed.1001081. PMC 3168867. PMID 21918641. ^ World Health Organization. (2000) World Health Report 2000 – Health systems: improving performance. Geneva, WHO Press. ^ World Health Organization. Health Systems Performance: Overall Framework. Archived 17 June 2012 at the Wayback Machine Accessed 15 March 2011. ^ Navarro V (2000). "Assessment of the World Health Report 2000". Lancet. 356: 1598–601. doi:10.1016/s0140-6736(00)03139-1. ^ "Mirror, Mirror on the Wall: An International Update on the Comparative Performance of American Health Care". The Commonwealth Fund. 15 May 2007. Retrieved 7 March 2009. ^ Organisation for Economic Co-operation and Development. "OECD Health Data 2008: How Does Canada Compare" (PDF). Archived from the original (PDF) on 31 May 2013. Retrieved 9 January 2009. ^ a b "Updated statistics from a 2009 report". Oecd.org. Archived from the original on 5 March 2010. Retrieved 6 August 2011. ^ a b "OECD Health Data 2009 – Frequently Requested Data". Oecd.org. Retrieved 6 August 2011. ^ "The Euro Consumer Diabetes Index 2008". Health Consumer Powerhouse. Retrieved 29 April 2013. ^ "Euro Hepatitis Care Index 2012". Health Consumer Powerhouse. Retrieved 29 April 2013. ^ "Life expectancy at birth, total (years) | Data". data.worldbank.org. Retrieved 3 August 2018. ^ CIA – The World Factbook: Infant Mortality Rate. Archived from the original on 18 December 2012 (Older data). Retrieved 15 May 2013. ^ "Mortality amenable to health care" Nolte, Ellen. 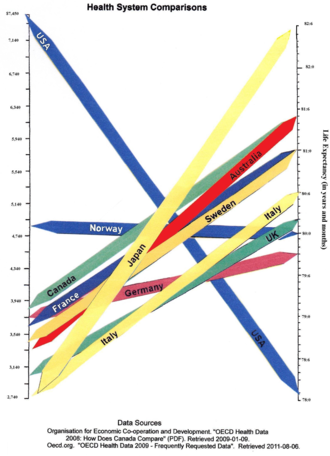 "Variations in Amenable Mortality—Trends in 16 High-Income Nations". Commonwealth Fund. Retrieved 10 February 2012. Nolte, Ellen. "Measuring the Health of Nations: Updating an Earlier Analysis". Commonwealth Fund. Retrieved 8 January 2012.